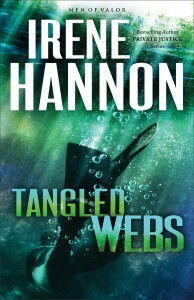 Having read some Irene Hannon in the past (Guardians of Justice series), I was excited to jump into Tangled Webs, her latest novel. Tangled Webs is the third in the Men of Valor series. Finn has packed away his combat instincts — but he may need them again when danger begins to stalk his quiet hideaway . . .
After a disastrous Middle East mission ends his six-year Army Ranger career, Finn McGregor needs some downtime. A peaceful month in the woods sounds like the perfect way to decompress. But peace isn’t on the agenda once he crosses paths with publishing executive Dana Lewis, a neighbor who is nursing wounds of her own. Someone seems bent on disrupting her stay in the lakeside cabin she inherited from her grandfather. As Finn and Dana work together to discover who is behind the disquieting pranks, the incidents begin to take on a menacing tone. And when it becomes apparent Dana’s foe may have deadly intent, Finn finds himself back in the thick of the action — ready or not.